You have a great marketing strategy and feel good about it. Marketers often join sales meetings and share their action plans, full of passion and excitement for the plan. Sometimes that passion doesn’t translate into the sales team, or you would like to see more of that passion transfer to Sales. Sales is just another customer persona and has their own language that Marketing should use. (You may want to read our blog on creating personas.) What does Sales want from Marketing? Sales enablement tools (videos, sales collateral, presentations, etc. ), leads (but qualified – not those waste of time leads) and brand awareness so that prospects will take a cold call as they have a positive association with the brand. Rather than stats and reports from Google Analytics, ensure presentations target what interests sales. When was the last time Marketing checked in with Sales as the sales enablement tools were developed? Is there a match between how Sales pitches the products and solutions? Are the case studies effective? Does the pitch deck allow Sales to customize as necessary while still keeping the brand guidelines intact? Basically, Sales gets excited when these tools are seen as useful. Ensure that they do. Have you seen a lead pass to Sales that wasn’t followed up on? It indicates a problem with engagement between the two teams. Downloading a whitepaper from the Resources area of the website does not make that contact a lead for sales. Instead, Marketing should engage that contact with additional content, in a structured and strategic manner to build engagement and predict their intent to purchase. We believe the traditional funnel has been replaced by a ping pong machine with contacts engaging and disengaging with a company due to shifting business priorities and busy calendars. This can happen over weeks and months. Rather than wasting Sales rep time by passing a new contact immediately along, ensure new contacts are nurtured and passed along to Sales only after they have indicated repeated interest over time. This will ensure the leads are of higher quality (that old quality over quantity debate answered!) and Sales will experience the benefit of responding to them. Building brand awareness is a time consuming and expensive task – and often can’t fully be measured in standard ROI calculations. For example, exhibiting at a tradeshow means that the company is exposed to every delegate who attends, through the materials and sponsorship opportunities. But how is ROI calculated? We see it over and over again – by the closed sales attributed to a contact met at that show. And, often that calculation starts weeks after the show, when the standard sales cycle is much longer (that’s a subject for a future blog!) There is much more value than that. And, this is only one example of a brand awareness marketing tactic that has fallen off in recent years as it is confused with a lead generating tactic. Another tactic to build a positive brand image is to develop and consistently execute high value thought leadership. The trend over the last year or so is to keep that content ungated, which means you allow an immediate download without asking for contact information. Gasp! We like to land somewhere in the middle and gate new content during the launch campaign but take away the gate once the campaign is over. Now, this is a brand awareness tactic instead of a lead generation tactic. 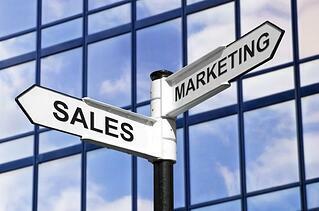 Is there a liaison between Marketing and Sales? An open and healthy relationship with good communication where it is acceptable to provide a critique and state opinions, even if they are not positive? If not, this needs to be developed. And if it is, use it to communicate the successes experienced on both sides. At Mezz, we don’t see a difference between the two departments and like to see positive and healthy relationships. Please contact us to learn more about engaging Sales through great marketing strategies. Ask us about our experiences with building passion and excitement to grow revenues well into the future.